Poi has a long tradition with New Zealand’s Maori people. Spinning Poi are weighted balls at the end of strings, which have a long, colourful ribbon attached, so that they can be spun around the body making hundreds of different patterns. In order to gain a basic understanding of how poi works, you should consider that you are standing within a large dice. There are 4 walls surrounding you (front, left, behind and to the right of you) and of course the floor below you and ceiling above you. These six walls will form the planes/areas that your poi move in. You have a poi in each hand. Please try the following tricks to get started. Circles You can spin large circles that keep your arms outstretched, or you can spin lots of little circles directly in front, behind or at the side of yourself. You can spin circles under the leg. The only place you can’t do a big circle is behind the back (unless you are totally double-jointed!) 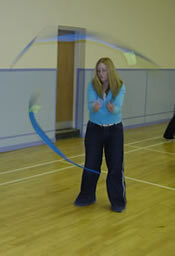 Practice with one poi to discover all the different places you can spin a large and small circle, then try with 2! Tadpoles Draw a circle in front of you with a poi parallel to the floor (just like you were stirring a cup of tea). The circle should be small. Bring in the second poi so that it does an alternating circle (eg so they don’t collide). This looks like 2 tadpoles swimming in a pond. The tadpoles can then go in the same direction. Poi can have a steep learning curve while you learn certain tricks and it is much easier to learn from finding someone at a Juggling Club to teach you (or through seeing diagrams in a book or watching someone on DVD), but with enough practice and the occasional bit of guidance, you will soon be moving the poi fluidly all over the body and even become more flexible as you attempt the behind the back tricks!